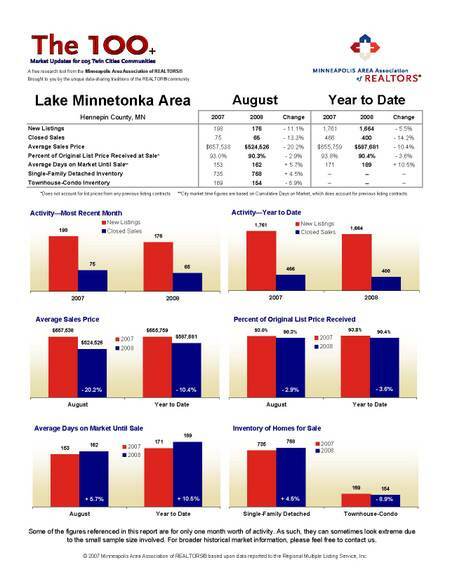 Want to know how many single-family detached homes are currently for sale in the Lake Minnetonka Area compared to last year at the same time? Of course you do. You're only human. Click here to access "The 100+" —our free monthly reporting tool that provides market information for 205 communities throughout the Twin Cities. Now updated with August figures, as well as a snappy new look. Did you know that you can find out how many houses sold in July in Castle Rock Township in southern Dakota County at 3AM in your underwear? You can also wear clothes if you want. Click here to access "The 100+." "The 100+," our community level market tracking tool has been updated with data from June. All real estate is local -- even from block to block. "The 100+" was built with this micro-level geographic truism in mind. Dig in by clicking here. We know for a fact that "The 100+" (now with 205 communities!) is one of the most popular services we provide. In the first quarter of this year alone it had roughly 15,000 hits -- the most views of any page on our site except the home page. This makes us happy. Keep making us happy by visiting it again and again. This month's edition features a slightly new getup, with the percentage change from one year ago added to the graphics below the data table in in the interest of ease-of-use and trend-readability. Click here to view the updated May figures for "The 100+."